daily newspaper strip on February 17, 1936, which was joined by a colour Sunday strip in May 1939; both are still running as of 2006. When Lee Falk died in 1999, he was succeeded by writer Tony DePaul and artists Paul Ryan (daily strip) and Graham Nolan (Sunday strip). Previous artists on the newspaper strip include Ray Moore, Wilson McCoy, Bill Lignante, Sy Barry, George Olesen, Keith Williams and Fred Fredericks. The Phantom is an American comic strip created by Lee Falk (also creator of Mandrake the Magician), recounting the adventures of the titular costumed crime-fighter. The series began with a daily newspaper strip on February 17, 1936, which was joined by a colour Sunday strip in May 1939; both are still running as of 2006. When Lee Falk died in 1999, he was succeeded by writer Tony DePaul and artists Paul Ryan (daily strip) and Graham Nolan (Sunday strip). Previous artists on the newspaper strip include Ray Moore, Wilson McCoy, Bill Lignante, Sy Barry, George Olesen, Keith Williams and Fred Fredericks. The Phantom is also published in comic books throughout the world, by different publishers. 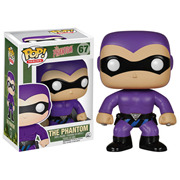 The Phantom is credited as being the first "costumed superhero", i.e. 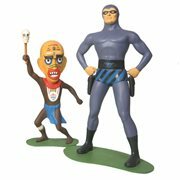 the first crimefighter to wear the skintight costume attributed to comic book superheroes, and being the first hero to have white eyes behind his mask. This article uses material from the Wikipedia article "The Phantom" and is licensed under the GNU Free Documentation License.